This research field concerns the study of the ground and excited states of soft-matter compounds, molecular assemblies, polymeric systems and low-dimensional nanostructures for organic electronics and nanotechnology applications. The main interest is on the effects of quantum confinement, chemical and environmental reactions and intermolecular coupling in the realization of (semi)conducting systems that may conjugate properties such as chemical stability, flexibility and self-assembly. This research line is dedicated to the first principles investigation of the electrical, optical or magnetic properties of organic and inorganic oligomers and polymers. This includes: (i) piezoelectric properties of polymeric fibers (PVD-TrFE) and carbon nanotubes for biomedical applications; (ii) electric properties of bimetallic halogen-bridged polymers (MMX) for nanoelectronics; (iii) optoelectronic properties or organic polymers (PPV, PFO); (iv) magnetic properties of valence tautomers for spintronics; and (v) thermoelectric properties of organic polymeric crystals (PEDOT, PANI) for low power generators. 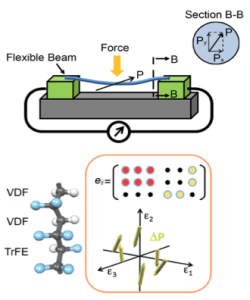 L. Persano, A. Catellani, C. Dagdeviren, Y. Ma, X. Guo, Y. Huang, A. Calzolari, and D. Pisignano, "Shear piezoelectricity in poly(vinylidenefluoride-co-trifluoroethylene): full piezotensor coefficients by molecular modeling, biaxial transverse response, and use in suspended energy-harvesting nanostructure", Adv. Mater. 28, 7633 (2016). A. Calzolari, B. Vercelli, A. Ruini, T. Virgili, and M. Pasini, "Fluorine-Induced Enhancement of the Oxidation Stability and Deep-Blue Optical Activity in Conductive Polyfluorene Derivatives", J. Phys. Chem. C 117, 26760 (2013). A. Calzolari, Y. Chen, G.F. Lewis, D. B. Dougherty, D. Shultz, and M. Buongiorno Nardelli, "Complex Materials for Molecular Spintronics Applications: Cobalt bis(dioxolene) Valence Tautomers, from Molecules to Polymers", J. Phys. Chem. B 116, 13141 (2012). L. Welte, A. Calzolari, R. Di Felice, F. Zamora, and J Gómez-Herrero, "Highly conductive nanoribbons of coordination polymers", Nat. Nanotech. 5, 110 (2010). 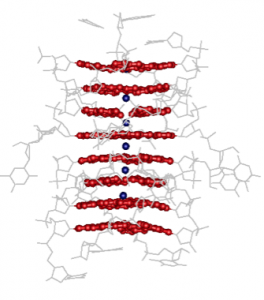 This research is focused on the study of intermolecular interactions among DNA bases, backbones and the environment and their effects on the charge transport along extended supermolecular structures. Systems of interest are DNA double helices [poly(G)-poly(C)] and supermolecular structures composed of DNA bases (e.g. dimers, G4). D.A. Ryndyk, E. Shapir, D. Porath, A. Calzolari, R. Di Felice, and G. Cuniberti, "Scanning Tunneling Spectroscopy of Single DNA Molecules", ACSnano 3, 1651 (2009). E. Shapir, H. Cohen, A. Calzolari, C. Cavazzoni, D. A. Ryndyk, G. Cuniberti, A. Kotlyar, R. Di Felice and D. Porath, "Electronic structure of single DNA molecules resolved by transverse scanning tunneling spectroscopy", Nat. Mater. 7, 68 (2008). A. Calzolari, R. Di Felice, E. Molinari, and A. Garbesi, "G-Quartet Biomolecular Nanowires", Appl. Phys. Lett. 80, 3331 (2002). The goal of this research is the first principles simulation of the optical and color properties of natural dyes (e.g. anthocyanins) in solutions for photovoltaics (e.g. DSSCs) and food-industry applications. 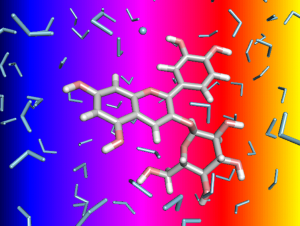 I. Timrov, M. Micciarelli, M. Rosa, A. Calzolari, and Stefano Baroni, "Multi-model approach to the optical properties of molecular dyes in solution", J. Chem. Theo. Comput. 12, 4423 (2016). X. Ge, I. Timrov, S. Binnie, A. Biancardi, A. Calzolari, and S. Baroni, "Accurate and Inexpensive Prediction of the Color Optical Properties of Anthocyanins in Solution", J. Phys. Chem. A 119, 3816 (2015). O.B. Malcioglu, A. Calzolari, R. Gebauer, D. Varsano and S. Baroni, "Dielectric and thermal effects on the optical properties of natural dyes: a case study on solvated cyanin", J. Am. Chem. Soc. 133, 15425 (2011). A. Calzolari, S. Monti, A. Ruini, and A. Catellani, "Hydration of cyanin dyes", J. Chem. Phys. 132, 114304 (2010).